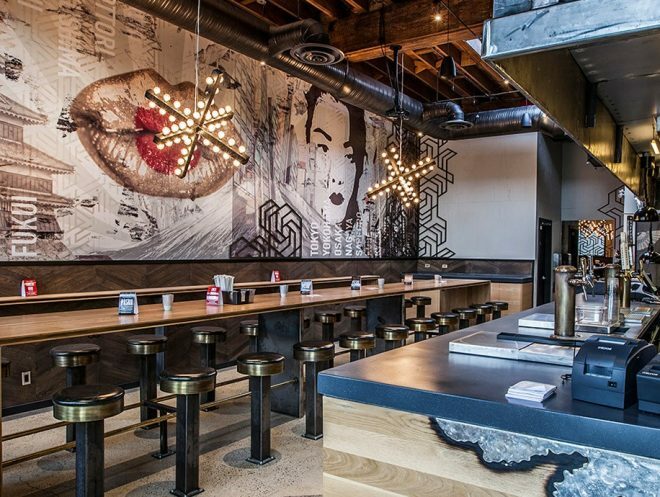 Q Shi Q is looking to lease food court space as well as quick service restaurant locations in the Greater Vancouver area for their unique and hip Tokyo bar inspired Japanese Barbecue concept. Prospective venues should be visible high traffic lifestyle/entertainment complexes/streets offering High-Identity storefronts, or situated in Central Business Districts, tourist areas, premium malls, Airports. Japanese food is more than Sushi or Ramen, and Q Shi Q is the only brand to capitalize on Japan’s most popular street food. Q Shi Q offers their modern twist on iconic Japanese kushiyaki with locally-sourced ingredients; skewers are carefully crafted from premium cuts of meats, seafood and vegetables, providing guests with a variety of innovative Japanese flavours, umami! Q Shi Q strives to offer above industry-standard service in a dynamic pop-culture inspired ambiance. Q Shi Q’s first location is on West 4th Avenue in Vancouver’s False Creek neighbourhood, just steps from Olympic Village.